Corns and calluses are irritating and likely painful conditions that form areas of thick skin due to excessive pressure or friction. They usually cause pain while walking or wearing shoes. The thickened skin that forms corns and calluses is known as hyperkeratosis in medical terms. A corn is a thick, localized area developed on the tops and sides of the toes or on the balls of the feet and has a circular or conical shape. They are commonly caused due to arthritis or poorly-fitting shoes. Corns are also known as helomas or clavi. They sometimes have a dry, waxy, or translucent appearance. The inner core of the corn can be soft or hard. A hard corn is a small patch of thickened, dead skin with a small plug of skin in the centre. A soft corn has a much thinner surface, appears whitish and rubbery. Soft corns are found between toes while hard corns may form on the tops of toes. Hard corns usually have a soft yellow ring with a gray center. A soft corn looks like an open sore. Corns caused by poorly fitting shoes often go away with the right size shoe. Calluses are hard, dry and thick areas of skin that can develop on hands, feet, or at any place where there is repeated friction or excessive pressure. They appear grayish or yellowish. The common callus usually occurs when there is excessive rubbing against the hands or feet. A plantar callus is found on the bottom of the foot. Calluses and corns are caused by repeated pressure or friction on an area of skin which causes the skin to die and form a hard, protective surface. For example using tools such as gardening hammer or sports equipments causes calluses on the hands. Calluses and corns on the feet are often caused by pressure from footwear. They can easily develop on the bottom of a runner’s foot. An abnormal gait or bone structure, such as flat feet or bone spurs can cause corn or calluses formation. Walking barefoot can also cause calluses. Soak corn or calluses in warm water– Soaking corn or callus in warm water for about five to 10 minutes or until the skin softens helps reduce the size of the callus or corn and provide relief from pain. Gently file the corn or callus– Dip the pumice stone in warm water and use the pumice stone to file the corn or callus. Circular or sideways motions help remove dead skin. Make sure not to take off too much skin. This can cause bleeding and infection. People who have diabetes or other conditions that cause circulatory problems or numbness are advised to approach a medical professional to remove dead skin. Apply moisturizing urea gel daily– Moisturizing Urea Gel with salicylic acid help gradually soften hard corns and calluses. Podiatrists advice using urea gel with salicylic acid for treating plantar warts, keratosis, heloma durum, and hardened calluses. Salicylic acid like other keratolytic products function as a peel, also smoothing and debriding dry skin. It helps to treat dehydrated, viral, and aging flaky conditions of the skin. 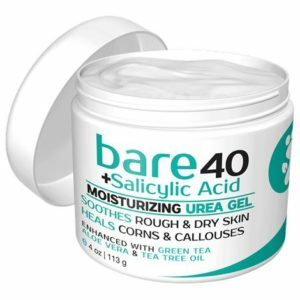 Bare 40 Plus Salicylic Acid Moisturizing Urea Gel with 2% Salicylic Acid provides a deeply moisturizing and ex-foliating experience to the skin. 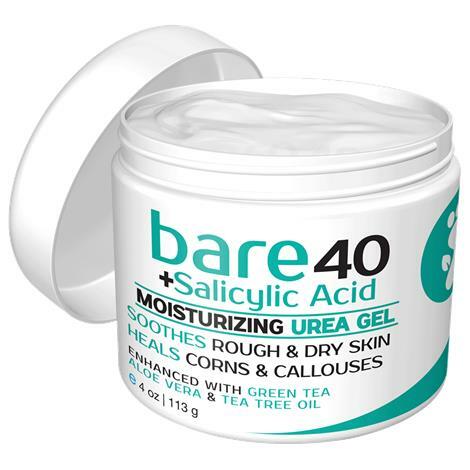 Bare 40 Plus Salicylic Acid Moisturizing Urea Gel is specially formulated to remove corns and thick calluses and helps repair cracked heels with the most potent therapeutic ingredients including Tea Tree Oil and Aloe Vera extracts. While using Bare 40 Urea Gel with Salicylic Acid make sure to apply it only to the callus or corn and not to the surrounding skin. Consult your doctor first, if you have diabetes or other conditions that cause circulatory problems or numbness. Wear proper shoe fit– Wearing wrong shoes is the common cause of corns. Choose the shoe that is the right size and aren’t too loose or tight. The ideal choice is shoes with wide and deep toe boxes. The wider toe box keeps the toes from pressing against each other and thus relieves the pressure on soft corns. Use protective padding– To protect calluses from further aggravation during physical activity, cut a piece of adhesive pads into two half-moon shapes and place around the callus. This would prevent a corn or callus from making contact with your shoe. You can also use protective padding such as heel cups, heel cushions, toe separators, toe crest pads, Toe caps and toe sleeves. Regularly trim your toenails– Long toenails can force the toes to push up against your shoe which leads to formation of corns and calluses overtime. Trimming toenails regularly remove this pressure. If you suffer from a medical condition like diabetes, your doctor can help you pare (trim) the callus or corn with a small knife. Visit a podiatrist– Make an appointment with a podiatrist, if the condition worsens or you regularly develop painful corns and calluses. The podiatrist may recommend orthotic inserts or metatarsal bar inserts for your shoes to distribute your weight more evenly on the foot. Most corns and calluses disappear gradually when the pressure which is causing them is relieved. If you suspect warts or have diabetes, consult a certified dermatologist, podiatrist or orthopedist to determine the cause of painful corns and calluses. Good to treat the discomforting calluses! My mother needs this product.